Good stuff, Scott. 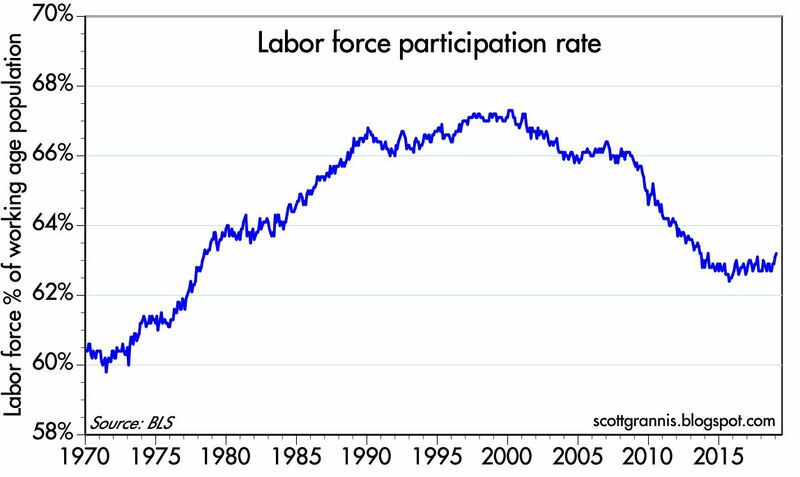 The labor participation chart is most telling. Looks like it may have hit a nadir-until the crazies take over and tax income to 70% and confiscate wealth illegally in the name of "inequality". I love it too that many uber wealthy people in the public eye (Buffet, Gates, Dalio etc...) want inequality tax AFTER they made their billions. What a load of anti-altruistic (selfish) bs. They want to APPEAR magnanimous when in fact what the F difference does it make to them if the government confiscates a few $B of their money? But is that good for the US economy? Hell to the no. And no one will convince me otherwise. Perhaps IF our illustrious government wasn't so profligate with their spending then at least the egregious theft could somehow be swallowed (actually...no it couldn't) but you and I know damn well that ain't gonna happen. Which is why in November of next year I'll go the booth close my eyes and vote DT. Great review and good news. 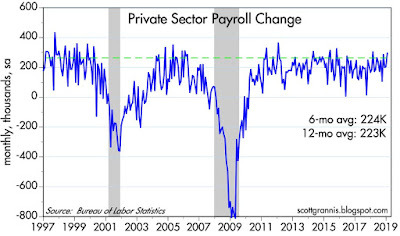 Nothing is better for the general population than very tight labor markets. I hope we see a couple generations of labor markets tighter than a drum. If we see some wage increases, that'll be the least of our problems. 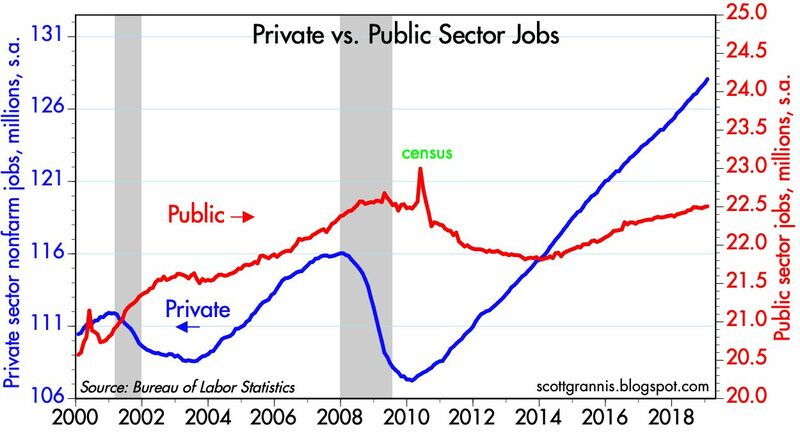 The US Federal Reserve, by constantly targeting higher unemployment rates, is doing all it can to elect Bernie Sanders president. I sure hope the Fed has seen the light. Re the link John provided, it reminds me much of "data mining" when it comes to system analysis for building quantitative stock trading models. Basically, the idea is if you throw enough variables at a set of data, one or two of them is bound to provide some fantastical "backtest" return over the past X years. Of course, it's all complete BS. Backtesting has cost traders more $ than probably any other idea. 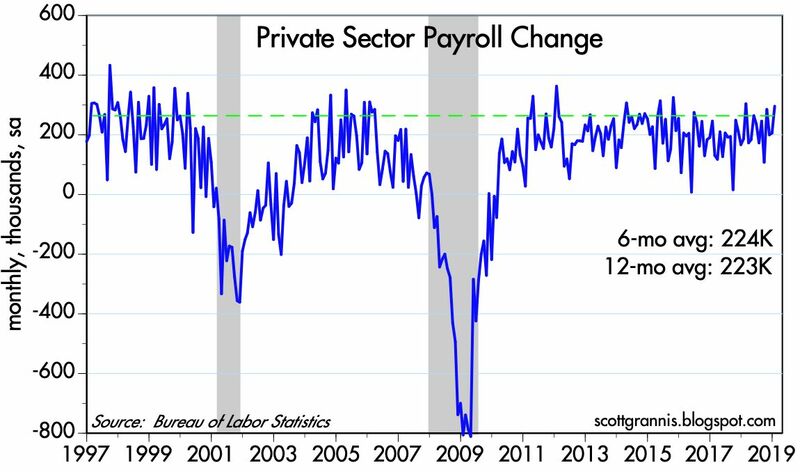 I have no idea if a recession is near but I sincerely doubt that if the unemployment rate ticks up to 4.1% from 4%, BOOM that's it due to a moving average. Oh and John I am not casting aspersions at you personally so please don't take offense. The U.S. corporate earnings seasons hits the mid-point this week, with around 234 companies in the S&P 500 so far reporting results. Collective earnings per share have grown by around 18% compared to the same period last year, just ahead of the 15.5% estimate for the entire reporting season, according to Refinitiv data. 71% of companies have also reported earnings that have beaten analysts' estimates, a figure that is firmly ahead of the long-term average of 64%." Thanks again Scott for all your articles. 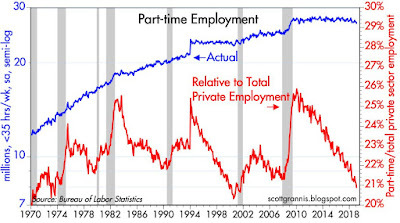 I find it interesting that on chart #4 part timers to full timers ratio seems to bottom before every recession. 2020? However I do not see much euphoria around. I remember clearly the .com and housing euphorias and wonder how the next one will feel like? The only “mainstream irrationality” I see is the rise of populism on all sides. Could that be the next “euphoria”? 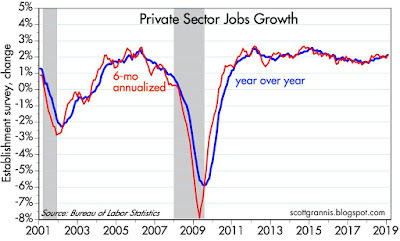 Re sub-par GDP growth. GDP growth has been sub-par for the past decade, averaging just over 2% per year. Growth has picked up in the past year or so. If Q4/18 growth comes in per expectations (~2.7%), then growth for 2018 will have been 3.1%, a welcome pickup from the pre-Trump trend, but still far short of what it could be if the economy were to be firing on all cylinders. I don't see any evidence that the market expects growth to be 3.1% or higher for the foreseeable future. It's more likely that the market is priced to more of the same sub-par growth (2.1-2.2%) that we've seen for the current business cycle expansion. I look to real yields on 5-yr TIPS for guidance on this score. Just a few months ago those yields reached 1.15%, which I took as an indicator that the market was beginning to warm up to the idea that sub-par growth was a thing of the past. But the yield has since fallen to 0.8%, an indicator that growth enthusiasm has dimmed appreciably. 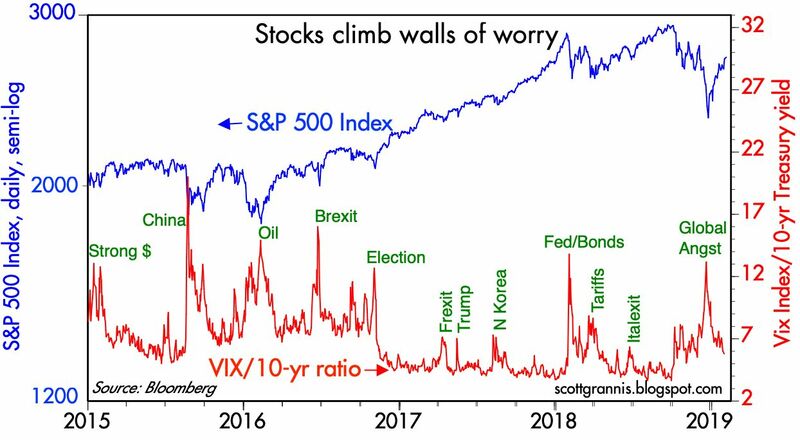 I think the economy has a lot of untapped potential, but it is being held back by uncertainties (Trump's volatile nature, the outcome of trade wars, China weakness, Eurozone weakness, and the future of tax policy. If the Dems gain control in 2020, their current agenda calls for a series of anti-growth measures (higher marginal income tax rates, a wealth tax, single-payer healthcare) which could have the effect of greatly prolonging the economy's sub-par existence. Thanks for the nice comment! I've been playing with real income and real house ideas as they relate to GDP growth -- the average worker is not able to save income and then invest profit into the economy, thus suggesting that while profits for corporations are expanding, there is an inequality function at work, which causes overall stagnation. Looking back 40 years or so, not sure if there is a solution that will solve this - as such, it seems that the deficit will explode and the tax base will shrink ... and so on. "It’s important to recognize that what we call “structural” real GDP growth (labor force growth + trend productivity) has declined persistently in recent decades, to a level that’s now down to just 1.4% annually. All additional real GDP growth in recent years has been driven by a decline in the rate of unemployment from 10% in 2009 to the current level of just 4%. 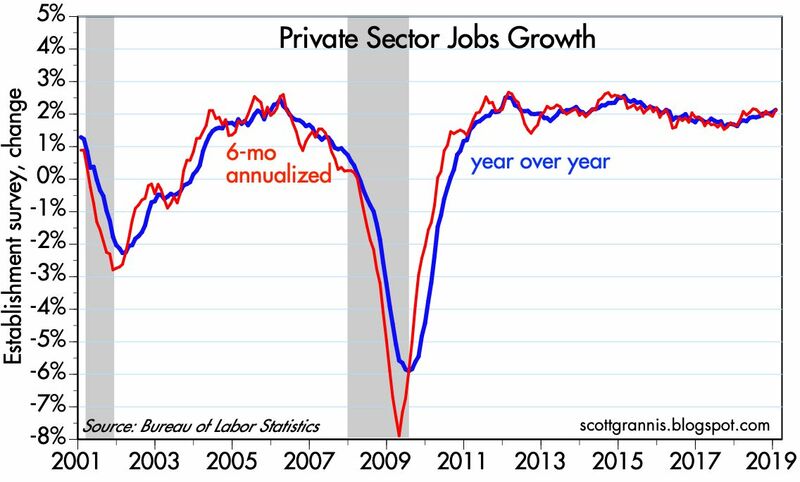 With a far smaller reservoir of “cyclical” economic slack, it’s likely that real GDP growth will slow toward that 1.4% structural rate. 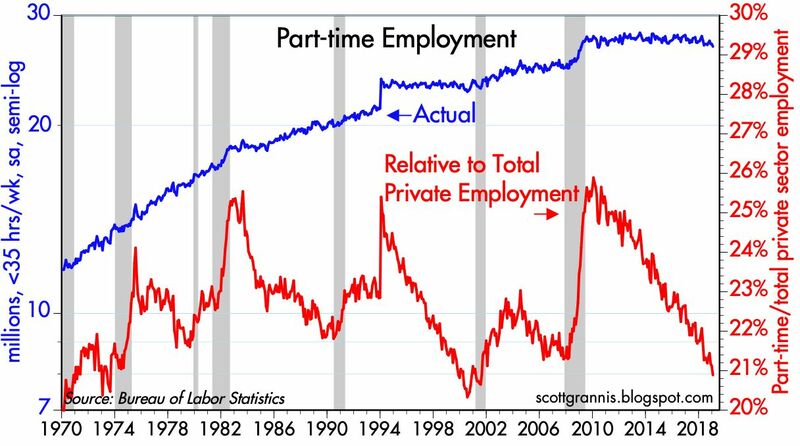 Any material increase in the unemployment rate would go hand-in-hand with a recession, and an outright contraction in real GDP." For the life of me I do not understand why anyone would follow a person with a verifiable FAILED 15+ year performance record. Despite what he says, Hussman is a "perma-bear". I take anything he writes with a serious grain of salt. Here's my FRED chart from FRED, sort of mashing together some ideas from GDP trend analysis. Although I'm mixing apples and oranges, the idea is that GDP has been obviously slow, but overall consumption may be slowing down -- which may go back to the Hussman (“structural” real GDP growth) thought -- and hence, impacts related to increased unemployment & GDP growth problems. FYI, I strongly agree that Hussman is not a reliable source, but stumbled on that yesterday. I also chased a few more ideas related to this, and apologize in-advance if this causes anyone stress, heartburn or confusion. tivity growth might be falling back toward post-1973 rates. productivity growth may illuminate trends in asset values. , Vol. 109, No. 1. (Feb., 1994), pp. 241-265. Re: Hussman. Let the record show that the total return of Hussman's flagship fund (HSGFX) has been -45% since the current bull market began in early March 2009. Over that same period the total return of the S&P 500 has been +350%. Pretty impressive! Seeing some weakness in Germany GDP, economy. Has the ECB overtightened again? 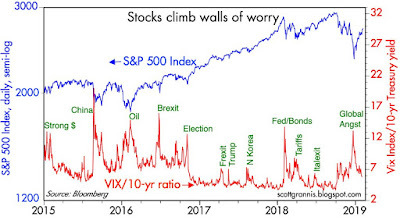 The Fed recently pulled back, and most seem to think that was the right move (including local hero Scott Grannis). But the ECB is tightening, and bringing to an end its QE program. Except Europe is slumping. This raises an interesting question. The Bank of Japan seems to be on a perma-QE mission. And the ECB may have to do the same. In the next recession, the Fed will have to go to QE in the first inning, since interest rates are scant already. Should central banks more-or-less commit to perma-QE? It sure would be a relief for taxpayers. Benjamin: I like the spirit of your thinking. But rather than commit to something like perma-QE, why not simply commit to a stable currency as measured in something asset-backed, something that can't be manipulated by the govt? If gold, or a basket of commodities isn't feasible, how 'bout simply basing central bank policy on an agreed-upon rate for breakevens (market-based inflation expectations)? The reason I think these would be better is that we can all imagine an environment in which QE isn't appropriate. I would hate to see the confusion that would result from removing a previously-announced permanent QE. Your bigger point, I think, is spot on: we need central bank policies that promote stability. And to that end it seems to me that we need to entertain some seemingly radical ideas, as you suggest. What Would Milton Friedman Say about Fed Policy Under Bernanke? In his 1992 book Money Mischief, Friedman called for legislation requiring the Fed to stabilize the spread between the nominal yield on regular Treasury bonds and the real yield on inflation-protected Treasury bonds (TIPS). This spread is the market’s estimate of future inflation. Friedman wanted the Fed to target expected inflation, and to promote price stability. As a forward-looking approach, this would also avoid the “long and varying lag” problems associated with backward-looking monetary policy. Looks like ECB and Fed policies are looking more and more pointless, as yields point towards less growth. I distinctly remember seeing MF on "Wall Street Week" and Lou Roukeyser asked him what he would do with the Fed and his answer was "replace them with a computer" and this was in the mid seventies! The greatest economist and supporter of free markets of all time was spot on. 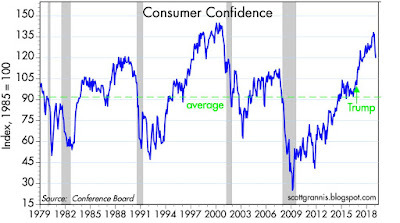 The Fed is made up of people who are emotional and make mistakes (as we all do). The MARKET should decide where rates belong not a bunch of individuals who by the way have a long term performance record that is pitiful. Yes there is a whole school of thought that a central bank should choose a nominal GDP growth target, and aim for that. In Japan, that might mean permanent QE. Perhaps Eorope too, and I concede Europe is not well-managed. I think in the next recession, we will just about put in for interest rates at zero for the duration. It might take 5 to 10 years of aggressive QE to recover the economy. Actually, I am even open to helicopter drops. I am not a fan of the gold standard. To evaluate the gold standard, why not just substitute the idea of a silver standard? What makes a gold standard any better or any worse than a silver standard? Yet, no one ever calls for a silver standard.